WHAT IS STOMACH CANCER ? The stomach is a muscular organ located in the upper abdomen. 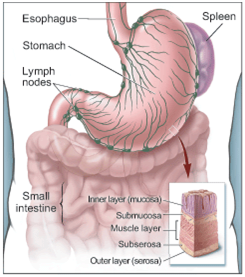 The stomach receives food from the esophagus, stores it and digests it partly. The stomach secretes acid and enzymes that sterilize the good and digest it. Stomach can be arbitrarily divided into three part: fundus, body and pylorus. The pyloric sphincter is a muscular valve that opens to allow food to pass from the stomach to the small intestine. Stomach (gastric) cancers usually arise from the inner lining (mucosa). These are usually adenocarcinomas. Rare variety of tumors in stomach include lymphomas, Gastro-intestinal Stromal Tumor (GIST), carcinoids, etc. These symptoms are similar to those caused by a peptic ulcer. If you are experiencing any of these symptoms you should see your health care provider so that a proper diagnosis can be made and timely treatment given. An endoscopy test along with biopsy when these symptoms occur can diagnose stomach cancer. Discomfort in the upper or middle part of the abdomen. Blood in the stool (which appears as black, tarry stools). Weakness or fatigue associated with mild anemia (a deficiency in red blood cells). As with most of the cancers related to bowels, the accurate staging can only be made after surgery. The staging can only give limited staging information in order to make treatment decisions. Treatment of stomach cancer depends largely on the location of the tumor, how far it has spread and the physical fitness of the patient. Stage 0 & IA cancers are limited to the inner lining layer of the stomach and have not grown into deeper layers, they can be treated by surgery alone. No chemotherapy or radiation therapy is needed. However, this stage can only be confirmed after surgery in most cases or using endoscopic ultrasound. Surgery is planned depending on the location of the tumor. This could be either subtotal gastrectomy (removal of part of the stomach) or total gastrectomy (removal of the entire stomach). Nearby lymph nodes are removed as well. These surgeries can be performed by open conventional surgery or laparoscopically or robotically. Robotic and laparoscopic radical total or subtotal gastrectomy reduces the trauma to the patient and yield in quick recovery. Alternative treatment for this stage would be endoscopic mucosal resection of the tumor wherein only the tumor bearing mucosa is removed. This can only be offered for select cases. The detailed description of surgery for all stages can be read at our professional page. Stage IB is when cancer has spread beyond the inner lining into the muscle layer or 1 or 2 lymph nodes near stomach are involved (can only be confirmed after surgery). The main treatment for this stage of stomach cancer is surgery (radical total or subtotal gastrectomy). Radical indicates that the lymph nodes around stomach are removed (D2 dissection). 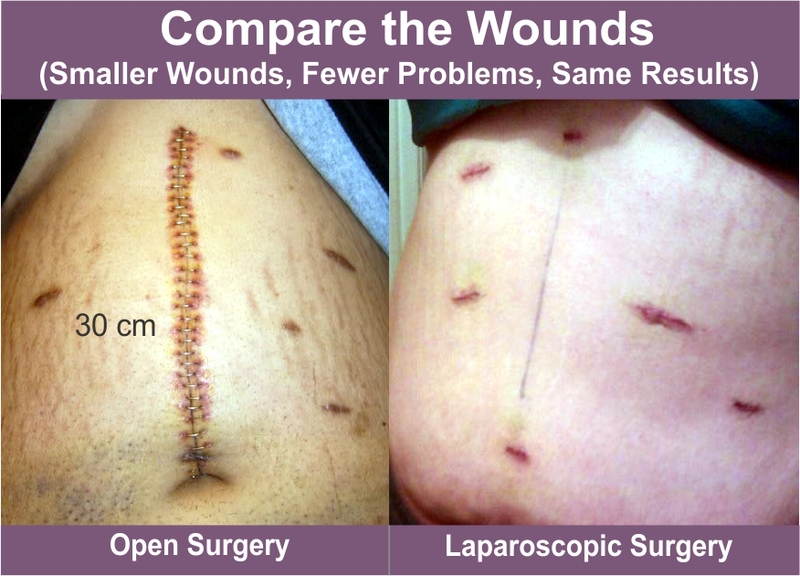 These surgeries also can be performed by open conventional surgery or robotically or laparoscopically. Laparoscopic or robotic radical total or subtotal gastrectomy reduces the trauma to the patient and yield in quick recovery. Chemotherapy (chemo) or chemoradiation (chemo plus radiation therapy) may be given before surgery to try to shrink the cancer and make it easier to remove. Stage II is when cancer has involved the entire thickness of the wall of stomach or involved more than 2 lymph nodes (can be confirmed only after surgery). The main treatment for stage II stomach cancer is surgery (radical total or subtotal gastrectomy). Like stage I cancers roboric and laparoscopic radical total or subtotal gastrectomy reduces the trauma to the patient and yield in quick recovery. 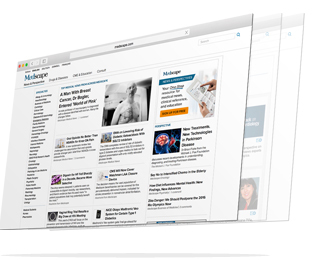 Many patients are treated with chemotherpay or chemoradiation before or after surgery. Stage III is a locally advanced disease wherein the cancer has spread outside the wall of stomach or there are large number of lymph nodal involvement around stomach. Surgery is the main treatment for patients with this stage disease (unless they have other medical conditions that make them too ill for it). When these are performed robotically or laparoscopically radical total or subtotal gastrectomy the reduced the trauma helps in quick recovery. Some patients may be cured by surgery (along with other treatments), while for others the surgery may be able to help control the cancer or help relieve symptoms. Many patients are treated with chemotherpay or chemoradiation before or after surgery. Because stage IV stomach cancer has spread to other organs, a cure is usually not possible. But treatment can often help keep the cancer under control and help relieve symptoms. This might include surgery, such as a gastric bypass (gastro-jejunostomy) or even a subtotal gastrectomy in some cases, to keep the stomach and/or intestines from becoming obstructed (blocked) or to control bleeding. Robotic or laparoscopic subtotal gastrectomy or gastro-jejunostomy will help these patients in quick recovery and go for the next line of treatment.